This intense thriller by Saul Black opens with a murder particularly tough to read because it features a woman and her two children at an isolated farmhouse. Why is it so horrible? The three are vulnerable, the countryside seems threatening, the snowy landscape is forbidding, and there seems no escape. I had mixed feelings about this book. I enjoyed the story and the efficient writing, I disliked the scenes of violence and skipped past them. The two killers are cold, ceaseless, unforgiving and unstoppable. 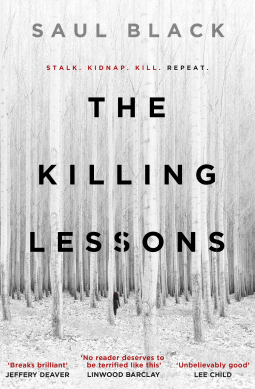 There are three story strands: the killers and their psychological battle for power; the daughter Nell, who flees and takes shelter; and the homicide detective Valerie Hart, troubled, alone, regretting a broken relationship [don’t all detectives these days?]. This book is more than its violence, more interesting are the predicament of Nell, and Valerie’s reaction to the appearance of her ex-lover. All three story strands are about trust: betraying it, losing it, and learning to trust again.